Indore, April 9 (IANS) Madhya Pradesh Chief Minister Kamal Nath's Officer on Special Duty (OSD) Praveen Kakkar, here on Tuesday, termed the income-tax raids at his residence and other places a "political operation". He accused the officials of breaking into his house at 3.30 a.m. on Sunday. However, he denied any torture by officials. Kakkar, interrogated by the IT team till late Monday, said the questioning continued for 46 hours. "They searched all the rooms and lockers, but could not find any objectionable document. At other places too, no objectionable material was found," he said. Income Tax officials for the third consecutive day on Tuesday were searching offices and residences of Kakkar, Ashwini Sharma, Manager of an NGO located in Bhopal's Platinum Plaza building, and his close aide Prateek Joshi. According to sources, huge amount of cash, gold and silver jewellery were recovered from Kakkar's Indore house and Sharma's Bhopal residence. 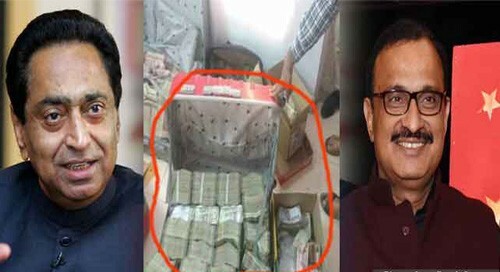 The officials also claimed to have discovered details of Rs 281 crore organised transactions, involving businessmen, politicians and bureaucrats.